My age (I was born in 1976) and my upbringing well outside of any arts-inclined bohemia, meant that I first came to know of James Benning -- a towering and influential figure in the mostly museum, college, and gallery-bound world of American experimental/avant-garde/Structuralist film -- very indirectly, through the work of his daughter; he is the father of Sadie Benning, a film/video artist (and sometime member of feminist art-pop band Le Tigre) whose underground Pixelvision shorts, which created pop-culture shockwaves at right around the time I was coming of age, were boldly intimate, personal, rough-hewn, and subjective DIY-"punk" iterations of lesbian-feminist experience and thought circa the early '90s. When I was finally exposed to the senior Benning's work in 2000 at a Portland Art Museum screening of his El Valley Centro (1999), I saw that father's films lack the defiant, high-energy, pop-reference-point-laden rush of daughter's (and, just for one revelation I gleaned from the experience, the association of the two distinct, albeit blood-related, artists in my head was a superficial, shaky, and unfair one); James Benning's films are just about 180 degrees removed -- neither inferior nor superior to, but very, very different -- from the immediate, inflamed, postmodern-performative energy with which video/film work by many artists of Sadie Benning's (and my) vintage was inflected. Though Benning Sr. is rightly reluctant to align himself with any movement or single category of avant-garde film, he got his start in the structure-obsessed '70s, and his work is marked by a formalist, very precisely organized aesthetic that owes at least something to the rigorous, pattern-seeking MO of structuralism. His movies are thus not at all "cool" in the usual sense of hiply talkin' 'bout my generation, but are actually cool in temperature and tone -- literally measured for tempo of editing rhythms, with images much more often focused on infrastructural objects or landscapes than human figures (let alone "characters"), with a markedly more distanced, thoughtful, and contemplative air. 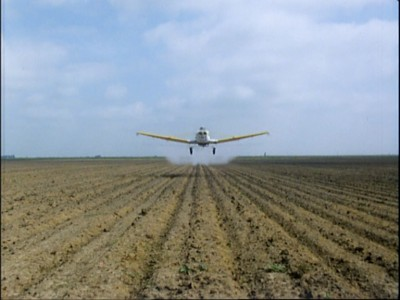 El Valley Centro, for example, follows without a single digression a "rule" that says each of its 35 shots (in its case, Benning's meticulously chosen and framed views of California's agricultural Central Valley, one of the United States' main breadbaskets) is statically composed and lasts exactly 2-1/2 minutes. 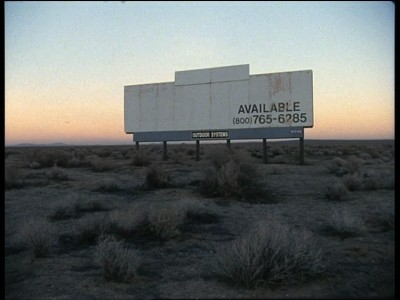 El Valley Centro is, moreover, the first part in a triptych of feature-length works Benning made at the turn of the millennium -- its sequels being Los (2000) and Sogobi (2001) -- that follow exactly the same principle, making them all feel authentically of one magnificent, meditative piece. These three works, collectively known as The California Trilogy, are not the kinds of things that reliably get DVD releases, but Edition-Filmmuseum, an archive-connected, highbrow German DVD imprint specializing in important, not readily available works like Benning's, has now made the trilogy commercially available on a two-disc set, to the great benefit of adventurous cinephiles everywhere. 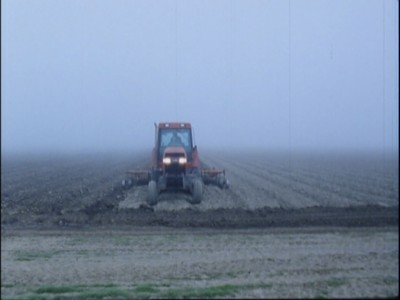 Taken together, the three films offer up exactly 105 "snapshots" of the oft-stereotyped and misunderstood Golden State (Benning's adopted home), broken down into general types of pictorial subjects: El Valley Centro, as mentioned, contains images of the Central Valley, with its wind farms, tilled rows punctuated by migrant workers, agricultural machinery, orchards, desolate highways, rural recreations (rodeo, fishing, speedways), problematic signs of the cattle and oil industries, and economically depressed (and looking it) mid-size towns. Los focuses on L.A.: Its famously artificial "river"; its freeways, ports, and anonymous intersections; its architectural juggling of commerce, people, and cars, cars, cars; and its incongruously downscale and marginalized (immigrant, homeless, exurban) spaces. Sogobi casts the net furthest of all, displaying California's natural wonders: Ancient sequoias, snowfalls in a forest, sandstorms in a desert, verdant hills and meadows and arid Death Valley, petroglyphs on mountain stones, salt flats and inland waterways, and geographical oddities like a cliff face that appears to have had designs chiseled into it by nature over the centuries. 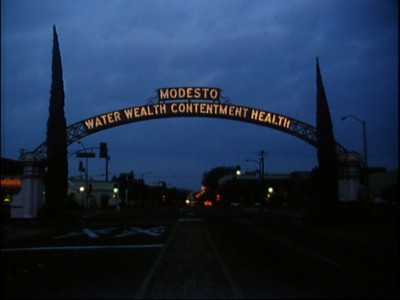 (The credits for each film helpfully identify specifically where each shot was taken; following Benning's trail is actually a tempting proposition, and would make for a much more worthwhile Californian excursion than most tourist itineraries.) 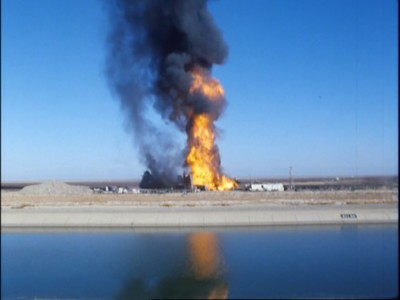 Benning sometimes shows humans in these landscapes, and more often faceless, industrialized human activity, which the stark framings and overall sequencing of the shots suggesting that the filmmaker views as problematic encroachment: Billboards, cars, oil, timber, cattle, and waste industries have long been a permanent part of this landscape, too, and must be included in what he means to be a far-reaching survey of California's vastly diverse physical manifestation(s). But those regularly interspersed images often jar, in their harsher noise and more troubling beauty, with the human-free landscapes and natural noises that surround them. In the films' most politically pointed composition, from Los -- a rare shot wherein humans are filmed close enough to make out their features -- a regiment of riot-geared L.A. police has assembled into a still, quiet formation under a sunny L.A. sky against a background of anonymous urban structures, with protesters heard vaguely chanting, offscreen, "Hey-hey, ho-ho, these fascist cops have got to go!" Unpacking the sonic and visual elements of this shot alone could be the subject of an essay, and it's only one of thirty-five at least as rich, if usually subtler, views. Only failing to meet them on their own terms and judging the three parts of The California Trilogy on misguided expectations of the more common kinds of movie action and drama would risk leading to the false impression that "nothing happens" in these films. What they have to offer is something uniquely, extraordinarily engaging, with a form of suspense and payoff that has to do with the sensuous physicality of the images, the inquisitiveness and concentration with which they've been created, and the synchronized, regular way they've been assembled together, which both gratifies and galvanizes in a way unavailable to narrative cinema. It's strange to think that the pleasures these movies have to offer are actually simpler, more basic and solid, than the work of psychological/narrative discernment and understanding that narrative features demand of us, and it's just the fact that most of us are less accustomed to non-narrative moviemaking that might lead to Benning's marvelous pictures being mistaken for intimidating or difficult to "grasp" in some way. But, at least in my experience, there's no better way to stretch out, becoming more accustomed to non-narrative film and discovering its exclusive, essential properties, than through something with the exquisite visual sensitivity and relatively straightforward formalism of an El Valley Centro. There's nothing to fret over and everything to enjoy in Benning's work; as The California Trilogy exemplifies, they're inviting experiences that require no special powers of interpretation, just a willingness to look a little longer and listen a little more closely than perhaps we're used to in order to acclimate to the extraordinary way they have of revealing themselves (along with particular things about our world and the ways we do, do not, or should more often look at it) to us. All you need is a little sincere curiosity and patience, and the great work in The California Trilogy will leave you soothed and provoked in new and refreshing ways, feeling as if you've traveled far and wide to someplace unfamiliar (even if it is familiar to you) and truly, deeply seen it, and perhaps even enabling you to regard the familiar things in your own world more acutely and with more interest, the way Benning has used his camera to demonstrate a superb, sublime method of seeing his. The quality of the picture on these discs ranges from more than fair to just shy of excellent. There's enough of the very particular texture and grain of 16 mm left to the images not to complain too much, but El Valley Centro in particular shows scratches and pops that may have benefited from a more thorough cleanup job, while a few spots have quite obvious haloing around sharper lines due to edge enhancement (perhaps a sign of overzealousness in applying digital noise reduction, which would also account for some bits having a more film-like look/feel than others). Still, it's an overall more than decent approximation of seeing the films projected in 16 mm, and there's nothing so egregious as to make the films feel compromised in any way. The discs' Dolby Digital 2.0 soundtracks perfectly preserve the films' original mono soundtracks. The sound is crisp and clear, doing full justice to films whose natural, directly-recorded soundscapes, though effectively dialogue-free, are a vitally important dimension of the experience. Nothing on the discs (Benning doesn't believe in audio commentaries or outtakes, prefering to let the works speak for themselves a they are). The packaging, however, does include a booklet, nicely illustrated with stills from the films, that features both German and English versions of a preface by Oliver Hanley of Filmmuseum, an essay on The California Trilogy by Benning scholar Claudia Slanar, and a brief meditation by Benning himself on seeing his 16 mm films finding a place in the realm of digital media, and on the wider shifts in film technology and exhibition that have found him now using digital videography for new works. Three films comprised of exactly 35 shots apiece, with each shot kept to a strict (but ample) duration of 2-1/2 minutes, James Benning's California Trilogy sounds more circumscribed and rigorous than it actually is, and is absolutely a better, more immediately rewarding introduction to non-narrative film than, say, the better-known, more abstract and difficult works of Stan Brakhage (this reviewer is happy to report that El Valley Centro was my own perspective-altering introduction -- or, better put, welcoming mat -- into movies that did something other than tell a story with a plot and characters). 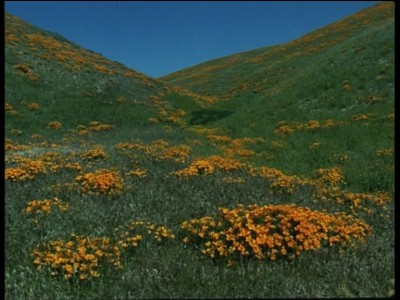 With each film dedicated to one strata of the Golden State's rich and multifarious vistas -- its agricultural/small-town Central Valley in El Valley Centro (1999), the L.A. region in Los (2000), and its wildernesses and deserts in Sogobi (2001) -- the trilogy de-familiarizes California and its stereotypical hippie-Hollywood mythology to reveal it as an endlessly diverse, mysterious succession of strange, beautiful, evocative visions of nature, human endeavor, and the sometimes tense or melancholy ways in which they overlap. Each film consists of one perfectly framed, statically composed moving picture, almost always a landscape shot, followed by another, and then another, at a clockwork pace but in a seemingly arbitrary order (though the juxtapositions created by each film's sparing, evenly-spaced cuts are vigorously rife with potential suggestions of meaning). Benning's ingenious structure builds a truly hypnotic, uniquely even and symmetrical rhythm that has the methodical regularity of the calmest, healthiest heartbeat, and that rigorous structuring principle, when combined with his awesome eye for both innately striking subjects and how to frame them most effectively, makes for its own kind of suspense and complexity; each 2-1/2-minute interval will reveal yet another unexpected and unpredictable view, and we're invited to not only consider what's shown within each shot, but also to ponder each one's relation to the ones preceding and following it, and to the whole, with no undue, vulgar emphasis on the filmmaker's part to interfere with our immersion and participation in the experience. The pictures Benning has very carefully, with exquisite care in selection and shooting, chosen to show us are mysteries that deepen, potential significations that multiply under the sustained gaze that is the key to pulling us inexorably into and overwhelming us with each view. It's an experience whose rewards and gratifications are atypical but many: In a world of ever-increasing, assaultive cutting speeds in "major" motion pictures, Benning's unmoving, perfectly framing camera eye, with its fixed, unblinking, penetrating stare, might seem initially to try our patience, insisting that we take at least one prolonged moment to consider every aspect of each shot, from initial, overall impact to each of its details (including sound, which becomes momentous in this context). But once you get into its slow, hypnotic groove, The California Trilogy is not a trial at all, but a wonderfully refreshing re-orientation of the cinematic senses -- a purification of film's power over time and space, a bracing invitation, written in exacting but breathtaking images, to really see, to truly respond in a way we never have before, as if opening our eyes for the very first time. Very Highly Recommended.